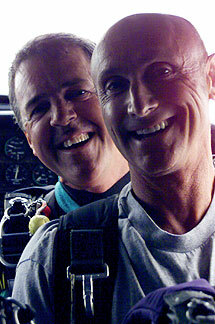 I did my first skydive, a tandem, on May 13, 2000. "Lets go!" were the last words I remember before the jump. 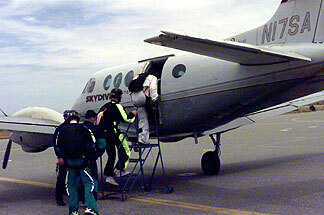 There had been 13 other sky divers aboard, but in a blur, they were gone. 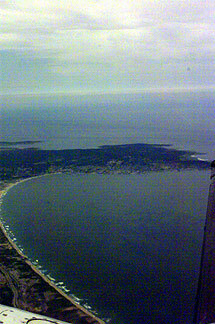 I was last and when I reached at door at 6,000 feet I took a quick glance below of the Monterey Peninsula and Bay and jumped! What had been anticipation and anxiety was transformed into maximum, total fear as I reached the door - it had to be momentum from the steps down the aisle of the plane that carried me into the open sky. For sixty seconds of eternity you are completely, totally free of all other worldly concerns; it's just you and the all-enveloping 120 mph rush of wind. Climbing to the drop zone I'd had time to think about my equipment and wondered that maybe I should have been equipped with something more than a harness and goggles. 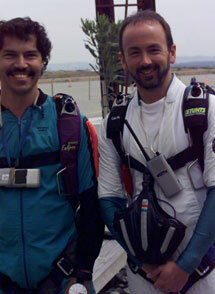 All of the other skydivers seemed to me to look like astronauts! Oh well, I didn't have to be worried about the extra weight! 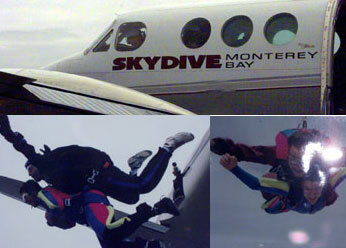 There was an incredible rush of adrenaline after leaving the plane. 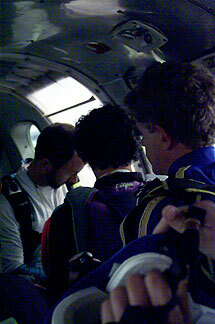 The thrill of danger sharpens your focus, slows time and heightens your senses - and yelling during the free fall, once I was able to catch my breath, really seemed to help me relax. 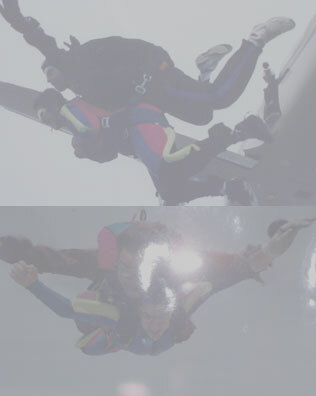 As you fall the mad rush of wind suddenly transforms into the peaceful calm of a parachute ride. I vividly remember looking at the earth's landscape below and now regret a missed opportunity to glance skyward, just to fix in my mind a picture of what a parachute looks like when you're strung beneath it. Raf probably asks all of his clients how they enjoy riding a roller coaster, and when he asked me, my response of "I do ok" led to a series of circles, turns and maneuvers which prompted more screaming and a stomach turned upside down. 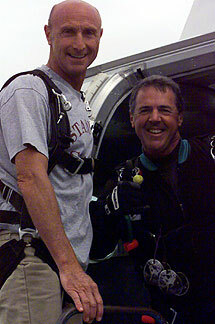 By the way, the big reason I decided on a jump was to avoid the agony and anguish of celebrating a 60th birthday party. 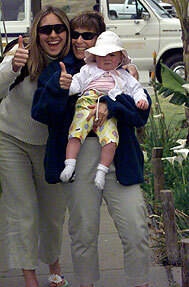 Friends and family were invited to join me in the skydive - but in the end only my daughter (Alisha) grandaughter (Madeleine) and Diane (Alisha's friend) were there for the show. The landing was so soft a 1 year old could have handled it!